Some combination of moving around for work and reading "The Life-Changing Magic of Tidying Up," inspired us to finally free ourselves of our clunky furniture starting with where we started & finished our day - the bedroom. We hit the interwebs looking for space-saving nightstands and found small nightstands of all kinds.. floating nightstands, narrow, skinny bedside tables but wanted to serve folks like us, who didn't want to invest in anything clunky furniture which would weigh us down from seeing the world. ORIGINAL MODERN DESIGN - Features a Scandinavian Minimalist Design & 2 Wire Slots for charging. STURDY - Safely holds up to 15lbs, putting your 13-inch Macbook, remote & water within arm's reach. 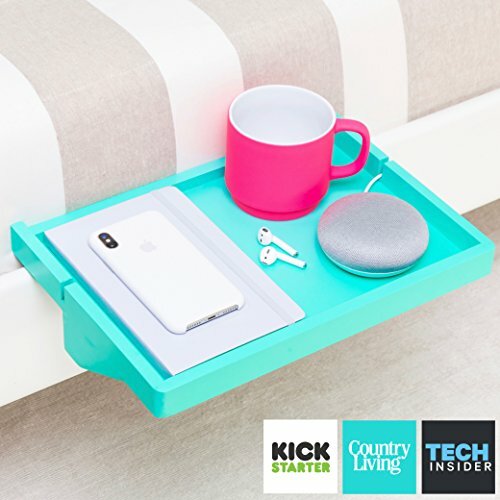 If you have any questions about this product by BedShelfie, contact us by completing and submitting the form below. If you are looking for a specif part number, please include it with your message.